An essential guide to writing and performing really excellent Christian sketches in schools, churches and youth events. With 25 great scripts, this practical book will help you decide which kind of production is best for your situation, set a budget, run rehearsals and more! 318 pages, from Gazelle. 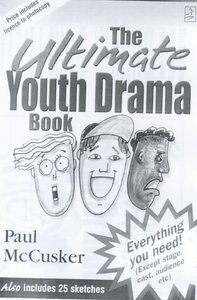 About "The Ultimate Youth Drama Book"
A guide to writing and performing Christian sketches in schools, churches, youth clubs and youth events. It includes 25 scripts which can be phoptocopied.